New year fitness resolutions that work! If you can’t see the image the idea is simple. Start the Reverse Advent Calendar when you start your regular Advent Calendar. 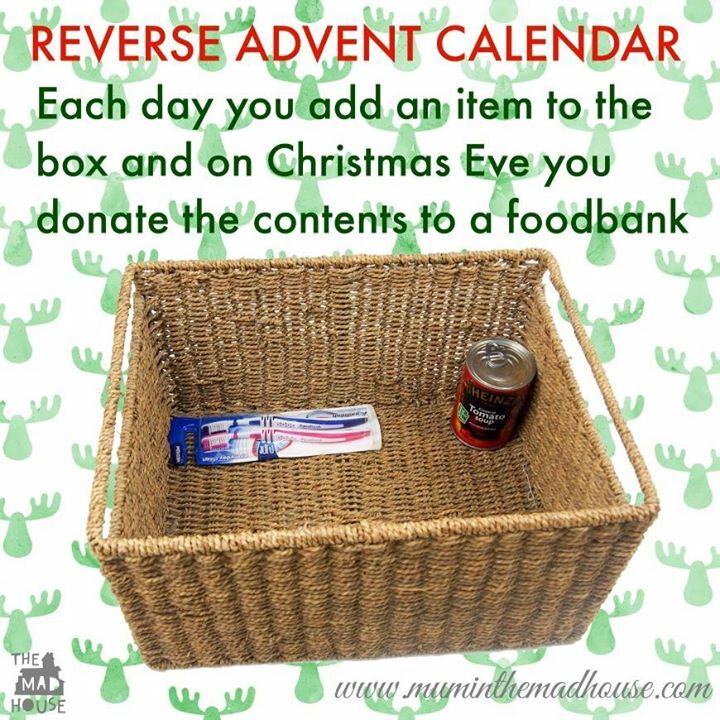 Grab a basket or box, and every day leading up to Christmas, add something useful to the box (tinned food, cleaning stuff, toys, whatever you think would be welcome). Then, on Christmas Eve (or even a day or two before), donate the entire basket and contents to your local charity. This year, make someone else’s Christmas a little bit brighter. This is such a great idea – we will share this on our Facebook page for our friends to see! Brilliant! Have shared this idea with our local scout group and our classroom teachers. Hopefully we get to start baskets there too. No need to wait for Dec 1st! I think it’s a great idea too 🙂 I’d really love to see Christmas return to being a holiday all about caring for those in need, instead of being about mindless consumerism. We are starting this the day after Thanksgiving, as that was she the Elf on the Shelf arrived at my grandchildren’s house and will be donating it on December 23rd. Looking forward to a new and exciting Christmas tradition. Great idea and our congregation at First Baptist Church in Melrose, MA, is participating to add to our own church food pantry, the Pantry of Hope, that serves many people weekly. Thanks for a wonderful idea for sharing with people who need food.